Why should you choose Media Temple? Save 33%. Get Started Now. Media Temple also known as (mt) is a premium web hosting company that the experts in the hosting niche look up to as the standard to which web hosts should be set. The company has been an innovator in cloud hosting services and has always remained ahead of the technology curve. It was started in 1998 by Demian Sellfors and John Carey as Intergress Technologies (a digital business company). Later in 1999, it was merged with one of its clients Media Temple and maintained the brand name Media Temple since then. The company is headed by Rod Stoddard as the President and headquartered at Culver City, California. In the last 17 years of operation, Media Temple has become a very popular web host with more than 125,000 customers by its side and hosts over 1.5 million websites in 100 different countries across the globe. Media Temple was acquired by GoDaddy in October 2013 but continues to operate as a separate business staffed by nearly 250 employees. GoDaddy decided to invest in and accelerate MTs growth, but continue it as a standalone brand. The customer list of Media Temple boasts of big brands like Samsung, Adobe, jQuery, Adidas, Starbucks, Sony, Toyota, NBC, The Wall Street Journal, Vogue and Volkswagen. Apart from big businesses, several web developers, professional bloggers and small to medium sized entrepreneurs trust MediaTemple for hosting their websites and apps. Media Temple offers a wide slew of hosting services that fit each webmaster’s needs – shared cloud hosting, VPS hosting, dedicated servers, managed wordpress hosting, even a private cloud server. Media Temple is credited for building the web’s first public cloud service, the Grid, which uses a cluster of servers to manage customer websites instead of a single server. This grid hosting is sold by the company as its version of shared hosting and is much more powerful and advanced than regular shared hosting service offered by other web hosts in the market. This type of grid architecture handles spikes in traffic very easily, is more scalable and delivers great performance in terms of speed and uptime. Media Temple Grid uses ultra fast SSD storage for both website files and database, comes with 30 day automatic backups, global CDN and 1-click application installs. Also the OS updates and malware scans are handled by the company. PRO – This is the basic plan that allows you to host up to 10 websites and comes with 20GB SSD storage and 1TB bandwidth. 1 Google Apps for work email account, 1 site global CDN and malware detection is provided for free. AGENCY – This plan has a provision for 100GB storage, 5TB bandwidth and can host a maximum of 50 sites. You can use 5 Google Apps for work email accounts with a total of 5 websites covered for malware protection and CDN free of charge. AGENCY + – This is the highest plan under Grid hosting. All features and capabilities are similar to that in Agency plan with an additional set of managed services by CloudTech. These include priority support, 3 monthly on-demand credits, setup assistance and personal consultation. The above 3 shared grid plans are priced at $30/mo, $150/mo and $350/mo respectively. But if you choose a yearly plan, you get 2 months of service free. Similarly with 2 year and 3 year plans, you get 5 months and 9 months of service discount respectively. Media Temple has introduced an interesting concept of resource boosters. If you need more resources for your website but do not want to upgrade to the next service level, you can add a resource boost to you current plan for a fixed monthly fee. Media Temple Virtual Private Server (VPS) hosting solutions have everyone requiring powerful server configurations covered. Self-Managed VPS – If you are a Linux expert and would not mind getting your hands dirty, Media Temple offers self-managed VPS, called DV Developer, which is pure raw Linux machine with full command line access. It does not include any control panel and customer is on their own to install and update any software. This service starts at $30 per month and goes up to $1000/mo depending on the plan you choose from the 6 server configurations available. Managed VPS – This VPS service, called DV, comes with a control panel to manage the hosting environment. It can scale up and down instantly according to your website requirements and includes a set of managed services like performance monitoring, automatic backups, malware scan and removal etc. This partially managed VPS service starts at $55 per month and comes with a choice of Plesk or cPanel control panels. There are 6 different plans based on RAM, storage and bandwidth configurations. Fully Managed VPS – The fully managed VPS service is for those customers who don’t want to bother with the technical aspects of server configuration and maintenance. The experts at Media Temple take care of server setup, application installs and updates, performance monitoring, security and support. This is a custom plan and starts at $249 a month. Personal – This plan supports up to 2 wordpress installs and 400K monthly visitors and includes 30GB SSD storage. It is priced at $20 per month. Studio – This plan comes with 100GB SSD storage and allows 10 websites with total of 2 million monthly visitors. It is available for $60 a month. Agency – This plan costs $240/mo and includes 500GB SSD storage and accommodates up to 50 wordpress installs with monthly traffic of 10 million visitors. All these plans include a free domain name and 1 free SSL for the first year. Just like Grid service, you can get 2 months, 5 months and 9 months of free service respectively when you buy 1 year, 2 year or 3 year plans. Media Temple has also partnered with Amazon to offer fully managed cloud hosting on Amazon AWS. With this service the Media Temple experts design and build AWS cloud architecture for your application and also monitor, maintain, optimize and back it up regularly. Media Temple provides a custom Grid control panel with its shared hosting. This is a very clean, easily navigable and fully responsive control panel interface. From here users have access to all site admin tasks and services, billing management and support center. 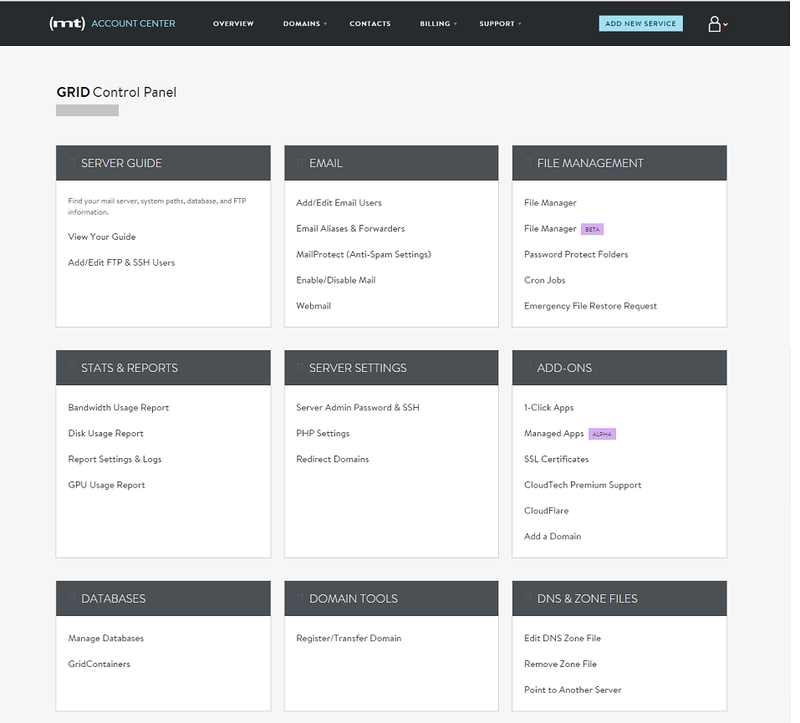 The Admin section of the grid control panel leads to sub-sections for handling Email, File Management, Database Management, Server Settings, DNS Settings, Site Statistics & Reporting and other add-on functionality. Customers also have access to 1-click application installs for WordPress, Drupal and ZenCart. For other web apps like Joomla, OS Commerce etc., you will need a manual installation. But, users of VPS hosting have access to over 200+ apps via 1-click install capability. Media Temple provides a hardware, network and infrastructure uptime guarantee of 99.999% for its DV products. This is popularly known as DV 20/20 guarantee. In case of any shortfall, they refund customers 20% of monthly hosting fee for each 20 minutes of disruption to service availability. Scheduled and emergency maintenance activity or DDOS attacks are excluded from this guarantee. To honour such a lofty uptime promise, Media temple ensures that its datacenters are maintained to the highest degree of standards and safety. Media Temple owns 2 datacenters on east and west coasts (Ashburn, VA and El Segundo, CA), both built to Tier IV specifications and connected to each other by a redundant fiber optic connection. These datacenters are equipped with N+2 redundant backup power and cooling systems, 24/7 monitored fire suppression, 24/7 armed security personnel and 48’’raised floors. Additionally a team of network engineers is constantly on guard to monitor the networks against any hacks, botnets or other issues. Toll Free Phone number for 24/7/365 telephone support. Also provided are a US number and several international numbers. Premium CloudTech Priority Support for cloud based services where certified sysadmins and engineers handle design, implementation and other technical aspects of your business. This is a paid option. All hosting services from Media Temple come with a money-back guarantee. While most services have standard 30 day money back guarantee period but the dedicated server hosting has a smaller window of 7 days. Any setup fee, domain name registration fee, handling fee or cost of service add-ons is non-refundable. When you cancel your account with Media Temple, the company issues a refund via Paypal or via check or in the form of an in-store credit. For annually billed services, the prorated refund is calculated on the basis of 10 months, since 2 months is provided free by the company for annual plans. Calculations for 2 year and 3 year billed plans are also done on a similar basis by reducing the number of free service months. So @mediatemple is having server trouble again.
. @mediatemple using your portal/platform makes me feel bad. soul crushingly bad. @nadiacosta . @mediatemple has been excellent for me! Back in Austin (since I'm sure you were wondering). Great day with folks like @tj_stein. @mediatemple with awesome stuff on tap in 2016! @matt_koon yes. Been using @mediatemple for years. Great support and WP options are numerous. @mediatemple s/o Brian P for his clear, concise and human approach to support. Very impressed.
.@mediatemple @mediatemplehelp A shoutout to Saul, Keisha, and David. Thanks for the awesome support! Sorry my site is down guys! Just got featured on CGSociety too…. @mediatemple hosting is having some big problems with their databases…. I’d say that’s pretty good. @iblueskytravel ugh. WordPress optimised, it's been so far so good for me. I have a friend who swears by @mediatemple though. Happy Hour Bound w/ my @mediatemple crew ???? @tduubq now I use @EuroDNS, I'm quite happy with it. For hosting I use @mediatemple ?? @dsmoore @mediatemple i just had to transfer ownership of an old domain i managed. worst experience everrrrrrrrrrrrr. @dlayphoto @mediatemple For real. Old, neglected blogs die hard, apparently. But they restored them! Pretty disappointed that @mediatemple now only offers grid hosting with email through Google Apps. Lost my recommendation to clients. @MissKrisSxSW @mediatemple @StubbsAustin Aww thank you! We try really hard to make sure everyone enjoys it. Terrible service from @mediatemple. Shocked really. I remember the days they used to give out free tees, now it's all computer says no. Bye. @jessefreeman the good news is I rarely have to pay @mediatemple because their downtime violates SLA! The @mediatemple support used to be great, but now it feels like a bunch of bots directing you to some KB article you have already read. Thank you @mediatemple for outstanding support with migrating my website. Agents were informed and offered thorough resolutions. Awesome. @hostmarks Media Temple really is the best! Their customer service is incredible! A+++ @mediatemple you rock! @mediatemple Most excellent. Thank you. I am seriously considering moving my sites to Media Temple. @mediatemple I'm so unsatisfied with your services. I pay high price for crap. @mediatemple Just wanted to let you know that Julian from your Support Centre has been extremely helpful to us today – brilliant service. Dear @mediatemple – thanks for making things which other people seem to make ridiculously difficult, really easy. @benjaminsobieck I use mediatemple. It costs me $30 a month. @docky I use mediatemple. They're basically fine! @clover Without hesitation I'm moving to MediaTemple.
.@tbwhs in the last 2 years @mediatemple kept its promises, upheld its values, delivered amazing support.